임진왜란 때 충무공을 도와 큰 공을 세운 오득린 장군이 마을에 정착하면서 심었다 하며, 마을의 좌청룡 우백호의 지세에서 오른쪽 지세가 약하다 하여 마을입구에 숲을 만들었는데 지금은 이 호랑가시나무와 팽나무 10여주만이 작은 숲으로 남아있다. 호랑가시나무는 호랑이가 등이 가려우면 이 나무의 잎 가시에다 문질렀다는 유래가 있는 나무로서 우리나라 남해안에 주로 자라는데, 전북 부안의 호랑가시나무 군락과 광주광역시의 노거수 1주가 문화재로 지정되어 있으나 이처럼 큰 나무는 찾아보기 어려워 호랑가시나무를 대표할만한 가치가 있다. 오득린 장군이 마을에 정착하며 심은 식재유래와 마을의 기운을 돋우는 풍수적 의미도 있는 등 조상들의 생활양식을 보여주는 역사·문화적 가치가 있다. This horned holly bush is said to have been planted by O Deuk-rin, a general remembered for his valor who fought against the invading Japanese alongside Admiral Yi Sun-sin, when he came to settle in this village. The village was deemed vulnerable, in terms of feng-shui position, on its right side, and a wood was created near the village entrance to address this geomantic flaw. Today only ten hackberry trees along with the horned holly bush remain of this wood. The horned holly is known in Korean as “horanggasinamu (tiger thornbush), as tigers, when they were numerously found in Korea, were fond of scratching their back against it. This shrub mainly grows along the south coast. 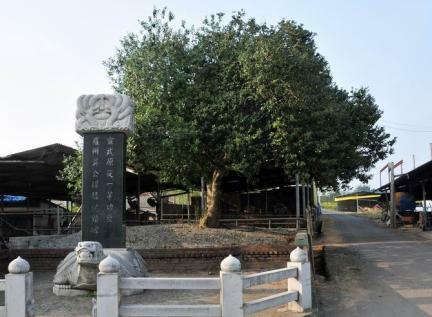 Although there already exist Natural Monument-designated horned holly bushes, including the horned holly colony in Buan, Jeonbuk and the large ancient horned holly in Gwangju, this one was deemed, given its exceptionally large size, to merit a separate designation. The fact that it was planted by General O Deuk-rin and the geomantic function it served for the village also endow this horned holly bush with additional cultural significance, as a mirror of lifestyle in traditional Korea.